The Series 60 platform is an undoubted leader on the platform market (that is one of the additions to the Symbian OS) mainly thanks to the successful Nokia's sales. Less significant smartphones are by Panasonic and Samsung ones are in sight. Gradually Windows Mobile develops and increases its market share rapidly. Such manufacturers as Motorola, Samsung, LG, Pantech, HP, Dell stand behind it and so do the operators (HTC products produced under operators' brands). These platforms are to struggle seriously since the second half of the year. At least for a year the Series 60's positions are out of thread, it will remain the leader but this leadership won't be absolute. Nokia will remain a trendsetter for the Series 60 platform and Windows Mobile will act from the HTC's side. Nokia announced the Nokia 6680 in February at the 3GSM Congress and you could have read about it in a special report from the exhibition. Two more models were announced at the same time - the Nokia 6681/Nokia 6682. Their differences are the absence of any 3G support (and of all the respective services) and a frontal VGA-camera, they are intended for the markets where 3G networks are not just absent but aren't planned in future. There are two body colours and the weight difference forming 2 grams is insignificant. There is another version of Symbian and all the rest is the same. The models their selves differ in low frequencies support - these are GSM 900 and GSM 850 (for the American market) and that is the only difference. The appearance of the Nokia 6638 (a CDMA variant of the Nokia 6630 with insignificant changes in functionality and design) allows supposing the same fate is prepared fro the Nokia 6680 (its CDMA model will be called, for instance, the Nokia 6688). The company segments the offer. Different models appear on different markets adapted for certain networks available in a certain region. This approach is well-taken and allows widening the audience at the most, making a flexible price policy with no fear of the grey market. A recent announcement of the N-series smartphones by Nokia shows the company approach well. That is the absence of the leader - a model that would combine the maximum of functions. Since the launch of such a model would automatically decrease the sales of other similar phones different in one-two functions. The N91 comes equipped with an integrated hard drive, Wi-Fi module but an old screen. The Nokia N90 has a new screen but no hard drive and Wi-Fi module. 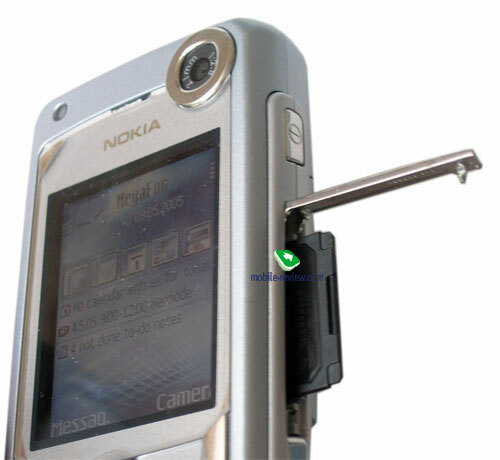 The Nokia N70 has neither a new screen nor Wi-Fi but as compared to the Nokia 6688 a 2MP camera and FM-radio were added. 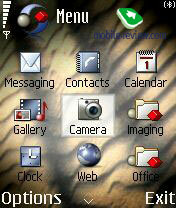 The Nokia 6680 is a reworked version of the Nokia 6630, the models are based on the same hardware platform. We'll discuss the differences starting with the design. The phone is available in two colour solutions - Light Bronze and Blue Silver (for the Nokia 6681 the colors are - Electric Blue, Pearl White, Light Silver). 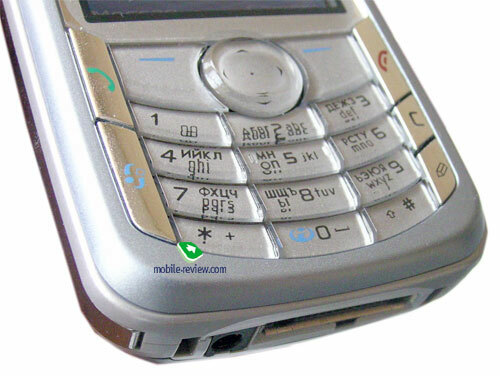 As different to the Nokia 6630 the body edging has a classical rectangular symmetrical drawing with rounding on the corners, the bottom expansions are absent (so called Nokia 6630's "ears"). The keys rows are placed terrace-like resembling an arc. They are placed between the two vertical rows of silvery side buttons. We consider the design well-taken and one of the best among the smartphones with no touchscreen. Those not accepting the Nokia 6630's design will certainly like the Nokia 6680. As smartphones take more and more place in the company's line their design will become more consistent. Such models as Nokia 3230, Nokia 6680 and Nokia N70 are the examples. The body material is an expensive, pleasant to touch plastic. You can read about the assembly problems in a corresponding part of the review, here we won't concentrate on it. These problems are likely to be solved with time; the manufacturing process has been put right. The dimensions of the phone are typical for Nokia's smartphones (108.4x55.2x20.5 mm) and the weight forms 133 g (the Nokia 6681/6682 are 2 grams lighter). The device may be carried almost in any pocket - in a jacket, trousers, it won't make discomfort. You will feel the weight carrying the device in a shirt. In general the device is for a man's hand but still not scaring women away. The device looses to the Windows Mobile smartphones by HTC in the dimensions are the weight, for example, the HTC Typhoon (107.54x46.2x17.5 mm 106.3 g). That is quite insignificant when pronouncing the numbers but just put the devices next to each other and will certainly notice the difference. To tell the truth, the comparison is quite incorrect - take the WCDMA support into account. The 5D joystick is very comfortable and rouses no cavils. 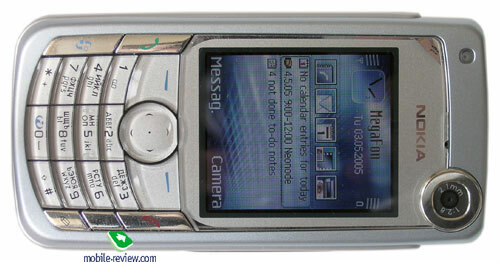 It is as qualitative as in the Nokia 6630 that means one of the best. It proved its best in games also. Large high comfortable softkeys are placed on both sides of it. The number row is placed below, the joystick seems even to run into the "2" key and that makes you press "down" instead of "2". You will get accustomed to the peculiarity just on the second day and forget about it. In general, the keypad is pleasant to work with; the buttons have average motion and precise respond when pressed. The keypad backlighting doesn't work in the daytime and at the bright light (a light sensor turning the backlighting off when it's unnecessary). The light-grey key backlighting works well in the dark, it is even and all the Latin and Russian characters are well-seen. A voice control button in on the left side and also it is responsible for the push to talk service. A power supply button and an expansion slot for RS MMC closed with a metallic shutter (naturally, hot change is supported) are to the right. Similar to the Nokia 6630 the device supports dual voltage reduced size Multi Media Card, since the reader supports only 1.8 W voltage. With time we'll pass to the commercial name of these cards and will write MMCmobile instead of DV RS MMC. Cards of this standard keep appearing on the market and now 256 MB ones are available; 512 MB cards are being sold in some countries. 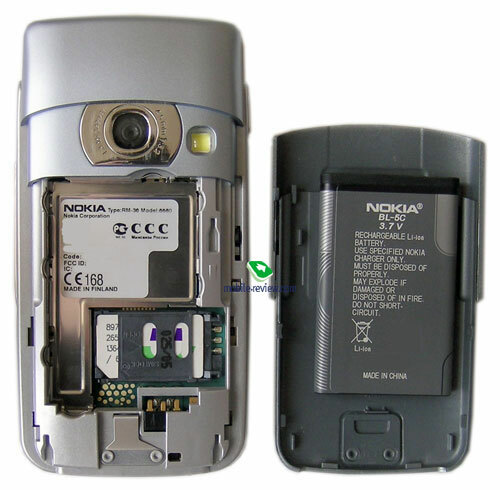 On the bottom there is a standard for Nokia products POP-port and a charger connector. A stereo headset is included into the kit. The sound is quite qualitative even with standard earphones. The minuses are low maximum volume, the music is unheard in the tube, you won't manage to plug your own earphones in, and the output is standard. An additional loudspeaker is placed on the top. Listening to the music is possible with it, the sound is pleasant, no noises at the max volume and no evident frequency fails. The screen resolution and size are standard forming 176x208 pixels, 2.13" in diagonal (41x35 mm - the active area). The manufacturer claims the 262K. But you won't find any differences from the Nokia 3230's screen showing 65K and the same about the Nokia 6630. The screen colour rendering remains only fashion. The screen is one of the best among the smartphones with no touchscreen. The comparison with usual phones' screens is incorrect. We'll only mention the resolution of 176x208 pixels gradually overcomes itself and in the Nokia N90 and future products we'll see a high resolution screen. You can adjust the backlighting manually, 5 levels. Besides, the system controls it automatically starting with the basic level set manually according to the light sensor data. The sensor is placed above the screen. Date and time are shown in the standby mode, also the profile name and missed calls with unread messages. A 900-mAh Li-Ion battery is changeable. If disassembling the phone you will notice a larger and more capacious battery might have been placed into the device. There is some free space between the battery and the back cover. The working time claimed forms 8 days in the standby mode and up to 4 hours in the talk mode. The device worked for 2 incomplete days (turned off by the evening of the second day) in case of 45 minutes of talks, 25 photos taken with no flash, an hour of working with other functions, Bluetooth on. Turning the Bluetooth off and using the device minimum (15 minutes of talks and 20 minutes of game playing) increases the battery life to 3 days. The battery worked for 1,5 days in case of 4 hours' MP3 listening and 15 minutes of talks. In general those speaking much will have to charge the device once a day. Using averagely will provide up to 2 days. Full recharging takes about 1 hour and 15 minutes. The battery is comparatively weak, the HTC Typhoon (I-mate SP3, T-Mobile SDA and others) work for 3-4 days with similar using. A standard SIM-card holder is placed under the battery; it is comfortable and deserves no special attention. 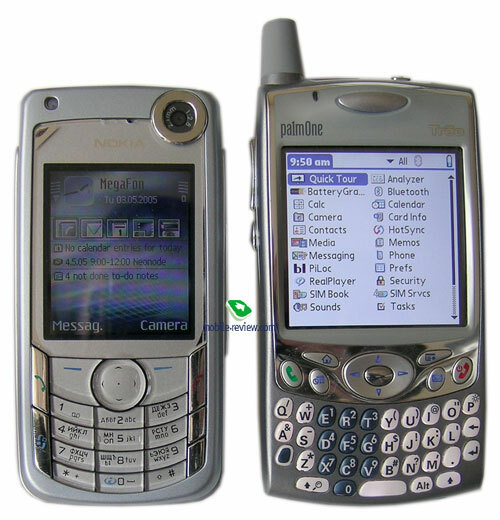 Similarly to the Nokia 6630, the device is based on the Series 60 platform Second Edition. The Series 60 2nd Edition Feature Pack 2 is used (or Series 60 version 2.6). 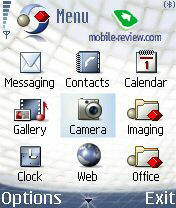 Shortly about the Feature Pack 2 from the Nokia 6630's review. The main change is concerned the operating system. That is the Symbian 8.0а version in the second pack. A support for a cheap NAND memory is included. The manufacturer may decide whether to use it or not. The expansion of standard APIs, particularly, adding the interfaces for automatic speech recognition, 3D applications, wider possibilities for working with sound, streaming data encoding. The eighth version also brings new possibilities of interface design, the windows may be semi-transparent. WCDMA. This is the main and the most significant change in the second pack. Any smartphone supporting UMTS will be based on the second pack or its later version. At the same time Series 60 Feature Pack 2 may be applied in some products but the device won't support 3G networks (Nokia 6681/6682 are the examples). Circuit Switch ( CS ) Video Call - a function responsible for video calls, everything is rather clear. Active connections monitor - applications may get info about what connections are active at the moment. Uploading files to a server - a possibility to send files from the phone to a remote server. Number, e-mail address, links backlighting in SMS, MMS. Having chosen a backlighted item you'll be able to save it or make other actions. 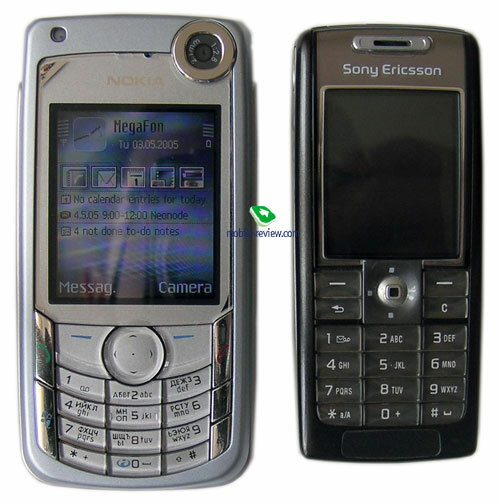 Such realization may be found in Sony Ericsson P900 or other smartphones by Sony Ericsson. RealOne Player - reproducing not even in a small window but full screen. Basic Imaging Profile - allows the devices supporting the profile changing the size of a picture before sending it via bluetooth and thus a high compatibility with the devices of another screen resolution is achieved. Java a support for calendar data from various applications, 3D graphics and a number of other improvements. 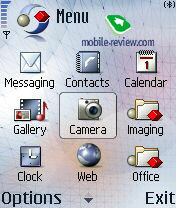 However the version applied in the Nokia 6680 is not the Feature Pack 2 itself, that is more an addition to it. That is an active slider, opening it will activate the camera and the main thing is Active Standby. 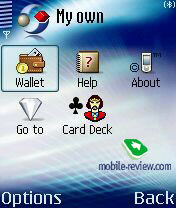 That is a copy of a Today start screen for Windows smartphones. Everything is quite logical - five icons for quick start of the applications. You can use the joystick to move along the list that may be changed by your wish, set the start screen for yourself. A to-do list is lower. If the player is on the bottom line shows the name of the composition currently playing. The icons are redrawn; they are pleasant and more qualitative. See it on screenshots. The set of preset themes really gladdens (they are on a card included into a pack), they are worked through well, the text is always seen. And the last thing to mention is compatibility with third party programs written for earlier versions of smartphones. Only half of the 12 at random set programs worked properly (half of the rest didn't run and the other half worked incorrectly). The problem will undoubtedly be solved in the next versions of the program. Don't loose this point out of sight when choosing the device. The Bluetooth realization is traditionally the maximum functional. All the necessary profiles are supported, including HID (plug a wireless keypad without any drivers). This is the advantage of the discussed smartphone over the mentioned recently HTC Typhoon. Most likely all the problems described here will be solved with time, in some months after the start of the sales. The front panel joins the body not close on the bottom, the backlash is seen, it got less with time but didn't disappear. The backlash of the bottom left corner is seen. Pressing the plastic to the left of the Menu button would activate the menu also. You can see a not even quality of the edges. Using the slider actively will lead to scratching the silvery edging around the camera objective. The camera used to fail running even after the restart of the smartphone reporting of a mistake. The solution is to delete the "Images" folder from the memory card. The device restarts sometimes when working with the camera. Looking through the themes (just looking through with no activating) leads to restart also (we saw the effect only twice or three times). The device is quite stable in general. The incompletenesses described are insignificant when working, but anyway we hope they will be improved in the nearest future. The 3D package SPMark04 test failed working and a system test (System Score) showed only 1183 points against 1551 in the Nokia 6630. A possible description is a high colour bit making the processing more complicated and thus the tests results are lower. The difference in processing 2D images makes two times. The Nokia 6680 also looses in other parameters but less significant. The JBenchmark 2 test result shows the device being inferior in all the parameters. The Nokia 6680 is one of the best in the connection quality. The Nokia's smartphone caught the signal even in the centre of the room where others (for instance, the Sony Ericsson t630) did only near the window. You won't notice the difference in the area of well covering. The signal is loud and hard to miss even in a noisy street. The vibracall is average. 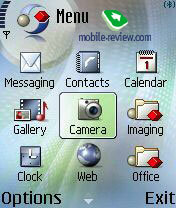 The Nokia 6680 is the best smartphone with no touchscreen for the moment. No direct rivals. Indirect rivals that come into mind is only the HTC Typhoon. It is smaller, lighter, works longer but having a weaker radio component, worse Bluetooth realization. Direct comparison seems incorrect - the devices base on different platforms. We see no sense in changing the Nokia 6630 to a new smartphone. The changes are not as principal. The price for the Nokia 6680 is too high now. It will have fallen to $450-470 by the middle of the summer. 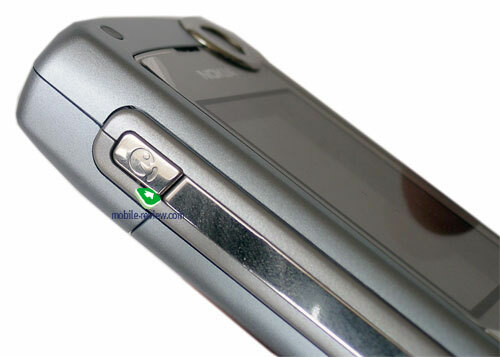 The sales will be successful but the announced Nokia N70 will prevent the device from becoming the hit of the sales. The demand of the most refined users will shift to this model and other N-series models. It's not evident which model to choose - the Nokia 6680 or 6681 (the receiving quality, another core version), we advise to wait for a respective review.